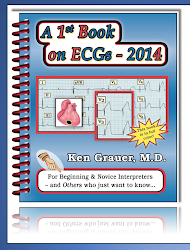 ECG Interpretation Review #142 (Ischemia - MI - Posterior - Dating Infarction - Chest Pain). 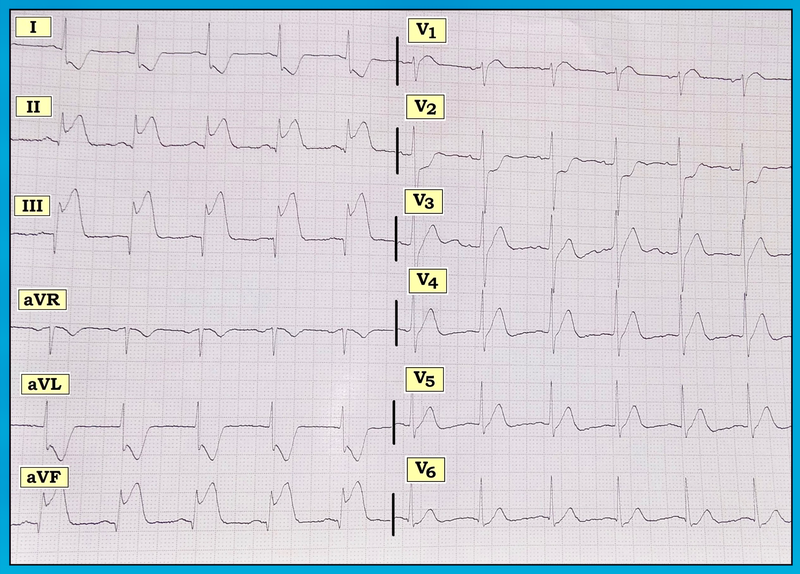 The ECG in Figure-1 was obtained from a 48-year old man who presented to the ED (Emergency Department) with a 3-day history of chest discomfort. It shows evidence of a MI (Myocardial Infarction). How would you “date” this MI? Which areas of the heart are involved? Figure-1: 12-lead ECG obtained from a 48-year old man with 3 days of chest discomfort. NOTE — Enlarge by clicking on Figures — Right-Click to open in a separate window. Interpretation: The rhythm is fairly regular at 85-90/minute. Upright sinus P waves are seen in lead II. The PR, QRS, and QT intervals are normal. The axis is leftward, but not by enough to qualify as LAHB (ie, the net QRS deflection in lead II is not predominantly negative). There is no chamber enlargement. Terminology Definitions: Before assessing for Q-R-S-T Changes in Figure-1 — it may be helpful to review terminology (See ECG Blog #94). We favor use of the lower case designation “q” wave when the initial negative deflection of a QRS complex is relatively smaller (ie, <3mm in depth). If the initial negative deflection of the QRS complex is larger (ie, ≥3mm in depth) — we favor the upper case designation “Q” wave. When the QRS deflection is entirely negative — the designation “QS” complex is used, since without any upright deflection in the QRS, one can’t tell if the all-negative deflection occurs “before” or “after” the R wave. Q waves are present in multiple leads. 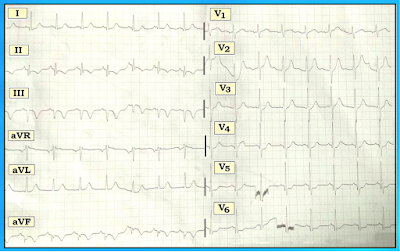 Small, narrow (probably septal) q waves are seen in leads I and aVL. The Q wave in lead II is narrow but deep (ie, it is virtually as deep as the height of the R wave in this lead). Of note, there may be a tiny initial positive deflection (r wave) in at least some of the beats in lead III. 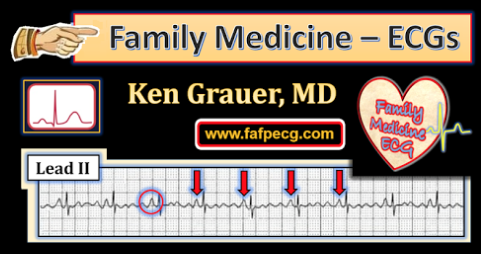 However, in lead aVF — the QRS complex is clearly all negative, which defines this as a QS complex. There is also a distinct notching (called fragmentation) on the upslope of this QS complex in lead aVF. Finally, there are Q waves in leads V4, V5, and V6. Although narrow, the Q waves in leads V5, V6 are somewhat deeper-than-expected to be simple “septal” q waves. Clinical Note on Q Wave Significance: In general, the larger and wider a Q wave is — the more likely this Q wave is to be “significant” (ie, indicative of infarction at some point in the patient’s history). That said, numerous exceptions exist — such that reliable generalizations about the clinical significance of Q wave appearance are difficult to make. It is common to see small narrow q waves in one or more of the lateral leads. 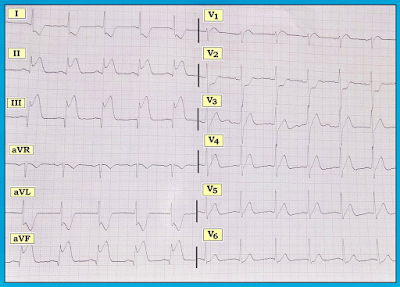 These “normal septal q waves” reflect the normal direction of septal activation, which moves from left-to-right. That said, distinction between normal septal q waves and Q waves indicative of previous lateral infarction may be challenging when q wave width and/or depth appears to be more-than-expected, as is seen here for the 3mm deep Q waves in leads V5 and V6. On the other hand, we can definitely say that QRS appearance in the 3 inferior leads (leads II, III, aVF) in Figure-1 IS strongly suggestive of prior infarction. In the context of a surprisingly deep Q wave in lead II and, an all-negative QS complex with notching (fragmentation) in lead aVF — even if a tiny initial positive deflection is present in some of the beats in lead III, the most likely explanation for this combination of findings has to be prior inferior infarction. R Wave Progression — is not normal in the chest leads. Normally, there should be a predominant negative deflection (S wave) in lead V1 — with the area of “transition” (where R wave amplitude supersedes S wave depth) not occurring until after V2,V3. Instead, R wave amplitude in lead V1 = S wave depth in this lead, and relatively prominent R waves are already seen by lead V2. Although there are a number of entities that may produce a Tall R Wave in Lead V1 (See ECG Blog #81) — recent posterior infarction should be at the top of this list, considering the ECG evidence of previous inferior infarction we have just discussed, and the ST-T wave changes we are about to assess. ST-T Waves — There is ST segment coving, with fairly deep T wave inversion in each of the inferior leads. In addition, there is 1-2mm of ST depression in leads V3-thru-V6, with a definite ST segment “shelf” in these leads. This strongly suggests ischemia. A final, admittedly subtle finding — is ST segment straightening with angulation of the junction between the straight ST segment and the beginning of the T waves in leads I and aVL. This makes these T waves (especially in lead aVL) appear more prominent than one might normally expect, given R wave amplitude in this lead. Dating an Infarct: A picture “tells 1,000 words”. Rather than QRST appearance in one or two leads — it is the composite picture of the entire 12-lead tracing, in context with the clinical history that “tells a story”. That said, it is good to appreciate that our ability to “date” an infarct from assessment of a single 12-lead ECG is far from perfect. 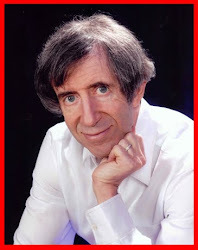 Practically speaking, we are limited to classifying ECG signs of MI as being: i) Acute ( = onset within the past few hours); ii) Old (occurrence more than several days ago); or iii) of Uncertain Age (ie, likely onset being intermediate between “acute” and “old” ) — which includes MIs that may be fairly recent, or of completely uncertain duration. Impression: The overall ECG picture that we see in Figure-1 is strongly suggestive of infero-postero (and possible lateral) infarction of uncertain age. In view of the history (ie, that chest pain began 3 days earlier) — there is an excellent chance that onset of the event corresponds to the onset of symptoms that began several days earlier. Against calling this infarction “acute” (ie, onset within the past few hours) — is the lack of ST elevation in Figure-1, and the presence already of large inferior Q waves. Yet persistence of ST coving with deep T wave inversion in these inferior leads — in conjunction with ST segment flattening and depression in many of the remaining leads strongly suggests that the event may indeed be recent. Careful questioning of this patient regarding the precise onset and nature of his symptoms over the past week is likely to be revealing. PEARL: With acute and/or relatively recent inferior infarction — there is almost always a reciprocal relationship in ST-T wave appearance between leads III and aVL. This is because electrical activity assessed by these 2 leads is almost completely opposite (lead aVL at -30 degrees; lead III lying 150 degrees away at +120 degrees in the frontal plane). Awareness of this relationship often provides an invaluable clue as to whether subtle ST elevation in inferior leads is likely to indicate an acute or recent event. Early repolarization should not produce reciprocal ST depression in lead aVL. Although subtle — there is a reciprocal ( = “mirror” image) relationship in this tracing between the ST coving with deep T wave inversion that is seen in lead III — and the subtle ST segment straightening with somewhat prominent T wave appearance in lead aVL. ST-T wave changes of “reperfusion” typically manifest the appearance seen here — that is, with no more than minimal residual ST segment elevation, and with deep T wave inversion in lead groups that overlie the area of infarction. Since anterior leads (ie, leads V1, V2, V3) provide a mirror-image perspective of posterior events — the prominent T waves we see in leads V2, V3 are most likely to represent recent posterior reperfusion. This is consistent with the presence of a disproportionately tall R wave in lead V1, with prominent R wave forces already evident by V2, V3. 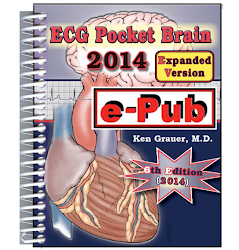 These findings all support the presence of recent posterior as well as inferior infarction. As suggested earlier, deeper-than-expected Q waves in leads V5, V6 may indicate lateral infarction of uncertain age. It is difficult to know if the lateral chest lead ST depression reflects reciprocal change or ongoing ischemia. The “Culprit” Artery: Statistically, we would suspect the RCA (Right Coronary Artery) to be the “culprit” artery of infarction in this case — since the large majority of patients have a right dominant circulation (See ECG Blog #141). That said, given the lack of ST segment elevation at this time, the criterion that compares the relative amount of ST elevation in lead III vs lead II cannot be used. Given the possibility of lateral infarction, and absence of ECG evidence suggesting right ventricular infarction — one cannot rule out the possibility of recent LCx (Left Circumflex) occlusion without cardiac catheterization. Case Follow-Up: Cardiac catheterization revealed severe multi-vessel disease, including diffuse involvement of the LAD (Left Anterior Descending) artery, diffuse LCx disease with prior occlusion of obtuse marginal branches that now show collateral filling — and, 100% occlusion with fresh thrombus in the RCA. Thus, the RCA was the “culprit” artery in this patient with preexisting extensive and severe coronary disease. BOTTOM LINE: The process of determining the onset of acute infarction is not always straightforward. The answer may not be forthcoming from assessment of a single ECG. Instead, careful integration of the clinical history, interpreted in light of the timing of troponin rise and ECG evolution on serial tracings is often needed. The process may be further complicated when a new event is superimposed on severe preexisting coronary disease. This case illustrates how helpful the history can be — even in a patient with preexisting disease, for deducing the likely onset of the most recent event. 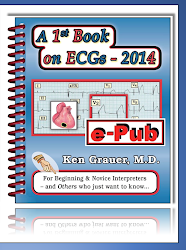 ECG Blog #94 (regarding Q wave terminology; assessment of QRST Changes). 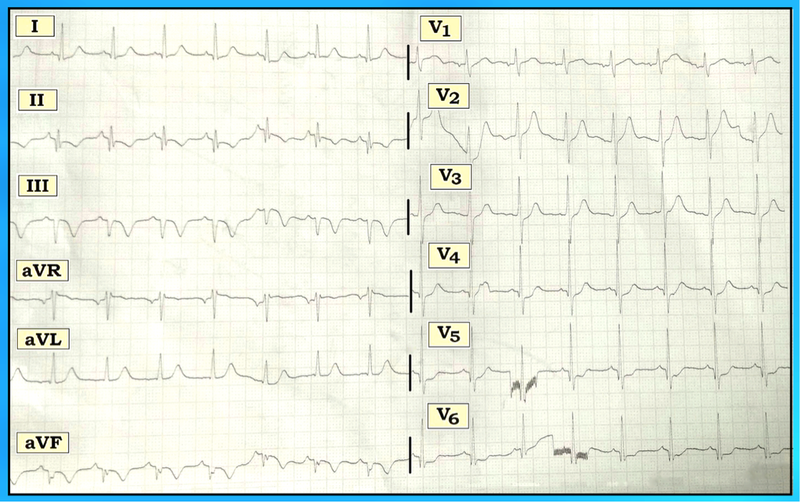 ECG Blog #81 (regarding differential diagnosis of a Tall R in Lead V1). 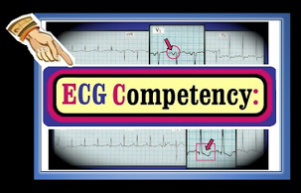 ECG Blog #80 (regarding distinction between LCx vs RCA culprit; Coronary Circulation; the "Mirror Test" ). 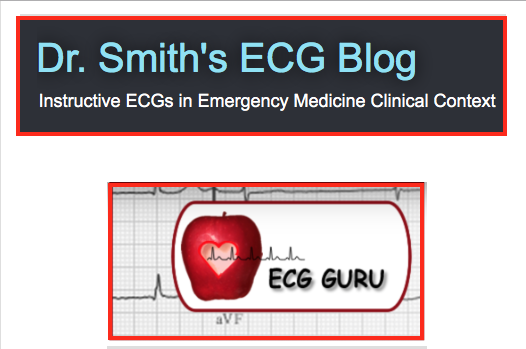 ECG Blog #141 (regarding assessment of the "culprit" artery). The ECG in Figure-1 was obtained from a man in his 50s, who presented with new severe chest pain. What area(s) of the heart are involved? What is the likely “culprit” artery? Figure-1: 12-lead ECG obtained from a man in his 50s with chest pain. What is the likely “culprit” artery? NOTE — Enlarge by clicking on Figures — Right-Click to open in a separate window. Narrow but fairly deep Q waves are seen in leads III and aVF. There is also a small and narrow q wave in lead II, and a tiny q wave in lead V6. Overall R wave progression across the chest leads is appropriate — although R wave amplitude in lead V2 is a bit taller-than-expected. Small s waves persist through to leads V5, V6. There is dramatic ST elevation in each of the inferior leads (leads II,III,aVF) with a “check-mark” appearance that strongly suggests acute injury. As a subtle finding, there appears to be slight ST segment elevation in lead V1. The ST segment in this lead is coved and clearly more prominent than is usually the case. There is marked reciprocal ST depression in leads I and aVL. Note how the shape of this ST depression in lead aVL is a precise “mirror-image” picture of the ST elevation in lead III. There is at least 4mm of “shelf-like” ST depression in lead V2 — which surprisingly largely resolves by lead V3. There is a hint of J-point depression in leads V3-thru-V6. Statistically, approximately 80-90% of patients have a “right-dominant” circulation (Figure-2). This means that after supplying the RV (right ventricle) — the RCA continues as the PDA (Posterior Descending Artery) along the undersurface of the heart to supply the posterior and inferior walls of the LV (left ventricle). In contrast, about 15% of patients have a left-dominant circulation, in which the RCA is less prominent. To compensate, the LCx (Left Circumflex) artery is a relatively larger vessel, and it (rather than the RCA) provides most (or all) of the blood supply to the PDA. As a result not only the lateral, but also the inferior and posterior walls of the LV are predominantly supplied by LCx artery in patients with a left-dominant circulation. Bottom Line — Statistically then, even before looking at the ECG, we can predict that the “culprit artery” for the vast majority of patients with acute inferior STEMI is likely to be the RCA (See also ECG Blog #80). 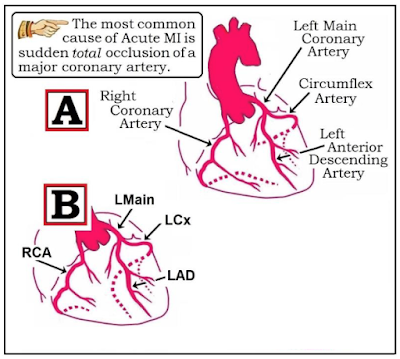 Figure-2: Overview of normal coronary anatomy. Panel A — the most common situation (80-90%), in which the RCA is a dominant vessel that supplies the RV as well as the posterior and inferior walls of the LV. The RCA also provides blood supply to the RV. The LAD (Left Anterior Descending) artery normally supplies the anterior wall of the heart (via diagonal branches); part of the cardiac apex; and a major portion of the conduction system (via septal perforators that run vertically down through the septum). The LCx (Left Circumflex) artery supplies the lateral wall of the LV. Panel B — represents a left-dominant circulation, in which the LCx (rather than the RCA) supplies the posterior and inferior walls of the left ventricle. 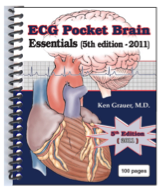 ECG features in Figure-1 that further support the likelihood of the RCA as the “culprit artery” are: i) ST elevation in lead III > II; ii) Marked reciprocal ST depression in lead aVL; iii) Relatively less (or no) lateral ST elevation, with the amount of ST elevation in lead III > V6; and iv) Evidence of acute RV involvement. 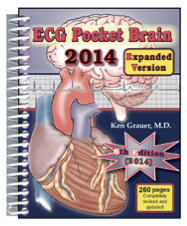 PEARL: The LCx does not supply the right ventricle. Therefore, if there is ECG evidence suggesting acute RV involvement in association with inferior STEMI — this is virtually diagnostic of the RCA being the culprit artery. While ST elevation in right-sided leads (especially in lead V4R) is clearly the best indicator of acute RV MI — lead V1 is a right-sided lead, and on occasion it may provide insight as to whether or not there is likely to be significant associated RV infarction. Normally the ST segment in lead V1 is flat or slightly depressed. With acute inferior STEMI — ST segments in leads V1, V2 and V3 often show ST depression due to accompanying posterior infarction and/or reciprocal changes due to the inferior STEMI. Typically, such ST depression is maximal in lead V2 — but it should also be present in V1. If ever there is ST segment coving (especially if accompanied by some ST elevation) in lead V1 — there is almost certainly acute RV involvement. In this case, the marked ST depression in lead V2 (Figure-1) indicates acute posterior involvement. This is supported by the taller-than-expected R wave in lead V2 (positive “mirror test” — See Figure 2 in ECG Blog #80). However, rather than ST depression in lead V1 — there is prominent ST segment coving with suggestion of slight elevation. In the setting of acute inferior STEMI — this is almost certainly the net result of right-sided ST elevation from acute RV infarction attenuating (opposing) the ST depression that should also be seen in lead V1 from acute posterior infarction. And, since the LCx does not provide blood supply to the RV — this finding of ST coving with slight elevation in lead V1, but with marked ST depression by V2 incriminates the RCA as the culprit vessel. It most often indicates proximal RCA occlusion. Note that the extent of acute infarction is obviously large in this case — since the amount of ST elevation is profound; ST elevation is accompanied by marked reciprocal ST depression; inferior Q waves have already formed; and inferior, posterior and right ventricular walls are involved. BOTTOM LINE: Due to the possibility of anatomic variants and/or collateral circulation — definitive identification of the “culprit” artery is only possible with cardiac catheterization. That said, recognition of probable proximal RCA occlusion in this case with associated acute RV involvement is clinically important — because hemodynamics may differ compared to predominant LV infarction (ie, nitroglycerin is not advised because it may excessively lower BP; hypotension in the setting of acute RV involvement responds well to volume infusion). See also ECG Blog #80.